On September 10, over 11,000 nurses and midwives marched in Warsaw in a nationwide protest called by the OZZPiP union of nurses and midwives. The union has been negotiating pay rises with the Ministry of Health. Over the last 15 years, nurses have been trying to get satifactory wage increases, to little avail. Many nurses earn in the range of 600 euros gross per month and the profession is now severely understaffed as women go abroad to work and few young people enter the profession. Wage increases in the past years have mostly gone to doctors and hospital administrators. The nurses had been threatening a strike, but it has not come to fruition. However, since negotiations keep coming up short, there is now nationwide strike preparation. The nurses are demanding an increase of about 350 euros per month, to be phased in over three years. A group of workers from Atlantic and subsidiary VIS Retail are fighting to get paid from bosses who closed up shop and disappeared. Atlantic is a well-known producer of underwear. It had over 200 shops and was a market leader in several E. European countries. In recent months, the company stopped paying workers, shops were closed down and people were out of a job without giving any notice. The owners of the concern disappeared, nobody answered emails or phone calls. After being contacted by a worker who wanted to take action, we found a several dozens more people. Their stories paint a sad picture of what it is like for unorganized workers whose bosses don't pay. Many had approached institutions such as the State Labour Inspectorate for help. But it does nothing in these situations and could not even offer advice as to what to do. As we know, the only thing which can be done is to organize and take action. After finding out that Atlantic was filing for bankruptcy, ZSP organized a protest at the court and confronted Wojciech Morawski, founder, former owner and Chairman of the Board of Atlantic and Bartosz Bielski, (former?) Chairman of the Board of VIS Retail. Workers demanded their money but only heard excuses from the bosses, who retorted that workers can just email them or that there was „no money”. Solidarity with the Wyszkow 7! Support the 7 nurses in Wyszkow hospital who were repressed for union activity! On June 15 the nurses from the Union of Anesthesiological Nurses won't go to work, for a number of reasons. They are demanding the reinstatement of the dismissed unionists, the elimination of health and safety risks, money which they were underpaid and an increase in salary. The nurses, part of an independent union at the hospital, were fired before the weekend for planning a strike. The hospital administration wrote up disciplinary dismissals for the women who have been working there for 30-40 years! It also has been hanging notices around the hospital claiming that the strike would be illegal and threatening to fire anybody who takes part. If you would like to support the nurses against this repression, you can send an email or fax to the hospital. See below. Respect Workers' Rights and Freedom of Speech at Jewish Historical Institute in Warsaw! 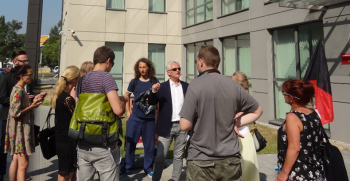 On May 28, members of the ZSP picketed at the Jewish Historical Institute in Warsaw. The reason for this was related to the actions of its director, Pawel Spiewak, concerning employees at the Institute and his more recent actions against our comrade from the ZSP. Two years ago some incidents occured at the Institute which could be described as retribution, discrimination and harrassment of unionists. At least that's how some workers saw it and a court decided in their favour. For example, a quite famous researcher and former KOR activist (Alina Cala) formed a trade union and was then moved to the archives to scan documents … which is a job for students. The same researcher had earlier received a dismissal notice with the reason given because of the union, but the director realized this is easily proven discrimination, so instead the notice was withdrawn and she was moved to this job which was well below her previous one. In total, six workers were banished to the archives – all of them were in the founding group of the union. A couple of them quit, a couple of them took Director Spiewak to court and won. We could say a lot more about this case and the atmosphere created at work by Mr. Spiewak. But we will leave this for now, because Mr. Spiewak is watching us! Anything we say can be will be held against us! Two years after the fact, Spiewak has decided to sue the owner of our internet domain name because there was information about this anti-unionist harrassment on our webpages. We are not the only ones who reported this situation, but I guess it really hurt Mr. Director to see that some people, including workers from the Institute, will not stay quiet about bosses who do such crappy things. People certainly had a different idea about who should be banished to the basement scanning dusty documents day in and day out. Unfortunately, despite the outcome of the court case, which showed how unfair the Director had acted, he is still in his position at the Institute. On May 16, during the „Museum Night” annual event, ZSP union picketed at the Copernicus Science Center in Warsaw. The action brought together two campaigns – against the use of outsourcing, trash contracts and the subminimum wage at public institutions and an organizing campaign in the Ekotrade agency. Ekotrade is known for its use of trash contracts and low wages and is used by the Science Center. Hundreds and hundreds of people were at the event. We spoke to people about the situation and handed out leaflets. The Center got very nervous and called the police, who were intent on stopping the action. Security and some event organizers tried to intervene claiming that we were not allowed to hand out leaflets on the sidewalk, which we ignored and made people more interested in what was happening. Despite the harrassment, a few hundred leaflets were given out. The ZSP has been campaigning for the past year against the use of trash contracts and the subminimum wage in public institutions. We fought successfully with the Impuls agency and many of their contracts were terminated. Our postulate is that public institutions either hire people directly or, if they do use outside companies, that the entity making a public tender should make workers' rights a requirement. Only firms which give proper contracts and pay at least the minimum wage should be used. These postulates have been gaining support. Despite the fact that the ZSP's postulates would be a good solution and even has some political support, some members of government pretend that such provisions cannot be put in a public tender. This is not true and a few days ago we saw the first example of how this could be applied in practice. ZTM, which runs public bus transport in Warsaw, holds tenders for various bus routes. It has now announced that workers' rights must be respected and it will put several conditions in the tender. One of them requires the bus companies to give the drivers work contracts. The local ZSP welcomes the initiative of the ZTM, which should be an example for other institutions. When justifying their decisions to make these requirements, they recalled the wildcat strike of 32 Ukrainian bus drivers in 2008. It was ZSP which had contacted them about their working conditions, documented the problems, publicized the case and helped the drivers get their payment. It has taken years for any action to be taken against the companies which the city uses and which exploit their workers. We are hoping that by focusing more public attention of the concrete cases of abuse that something will begin to shift. We also invite the agency workers to join us and organize! International Nurses' Day in 2015 was above all a wave of protests and warning strikes which took place in many cities in Poland. Many of them was organized by the OZZPiP (Union of Nurses and Midwives). In some places unions protested with the support of regional chambers of nurses and midwices. In the Silesian Voivodship, strikes took place in at least 9 hospitals: in Bielsko-Biała, Czeladź, Jastrzębie Zdrój, Katowice, Knurowie, Racibórz and Wodzisław Śląski. In Bielsko-Biała about 100 people took part all together in the protests organized by the Union of Psychiatric and Rehab Workers (ZZPLPiU) and the ZSP-Health Care Workers union (ZSP-PSZ). What is important is that the postulates concerned all workers employed in health care. Workers from the OZZPiP from Bielsko Biała and Zywiec region joined in. In Małopolska the OZZPiP organized a demonstration with over 200 people on the main market square in Krakow, which was supported by other unions in the branch. Solidarity from Wadowice and a delegation of doctors from ZSP-Health Care Workers union also took part. On May 12, workers from a number of hospitals in Poland went on strike to protest the tragic situation of health care workers. 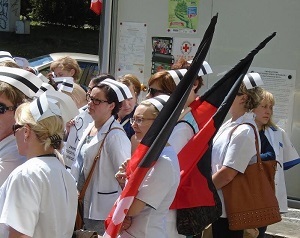 Mostly this was an action of nurses unionized in the OZZPiP and was made to coincide with International Nurses' Day, but the ZSP Health Care Workers Union also took part in the strike, as did the Union of Psychiatric and Rehab Workers in the city of Bielsko-Biała. 30 workers went on strike in the psychiatric hospital, hanging a red and black flag on the hospital. They are demanding a 400 zloty raise (about 100 euros). Currently, many of the workers make around 450 euros a month, gross. Some earn a little more, depending on their profession. Organized labor in the health care services is usually divided into profession. Therefore the nurses and midwives have their own union and when they protest, they are only protesting about their condition. Other professions usually do not support the protests. Our union is the only one we know which is not like this. Different workers participated in the strike: cleaners, orderlies, physical therapists, nurses and even a psychiatrist. During the day, part of the striking workers went to the Starosta office. These politicians are responsible for overseeing the hospitals in the city. They were joined by nurses and midwives from OZZPiP from the Voivodship Hospital that also went on strike.